The fourth week in the 5-week My Little Pony event brings out the series' very first villain: Nightmare Moon. Nightmare Moon is an entity that took over Princess Luna when she allowed her jealousy of her sister, Celestia, to overtake her. She was banished to the moon until she was able to return a thousand years later, being defeated by the Mane Six and the Elements of Harmony and restored to her former self. Nightmare Moon discovers the Nyx. 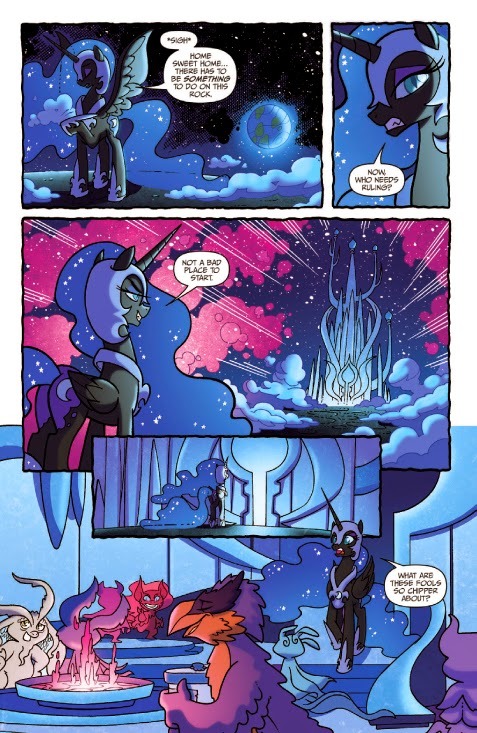 This issue takes place between her banishment and the pilot episode, where she encounters the Nyx on the moon: beings who give the Ponies their dreams and banish their nightmares. 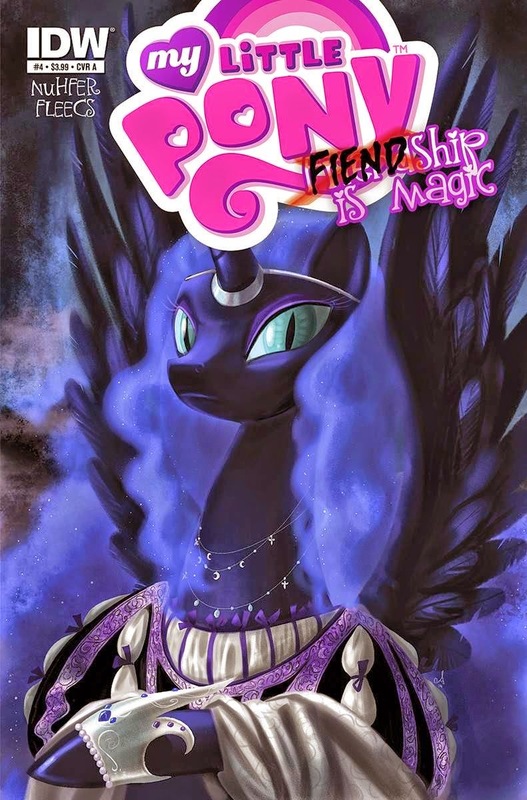 Feigning friendship to learn their secrets, Nightmare Moon plans to enact her revenge on Celestia through dreams. Nightmare Moon learns about what the Nyx do. GRADE: B+. While a charming story with some funny moments, Nightmare Moon didn't come off as the threat she was introduced as in the series; rather, she was closer to the awkward Luna attempting to readjust to being good as she was portrayed in her next appearance. That, mixed with several continuity issues, is what brought the grade down. Discounting any history, however, Heather Nuhfer's story stands fine on its own as a fun read aptly complimented by Tony Fleecs' art, and offers yet another insight into how the world of Ponies works. 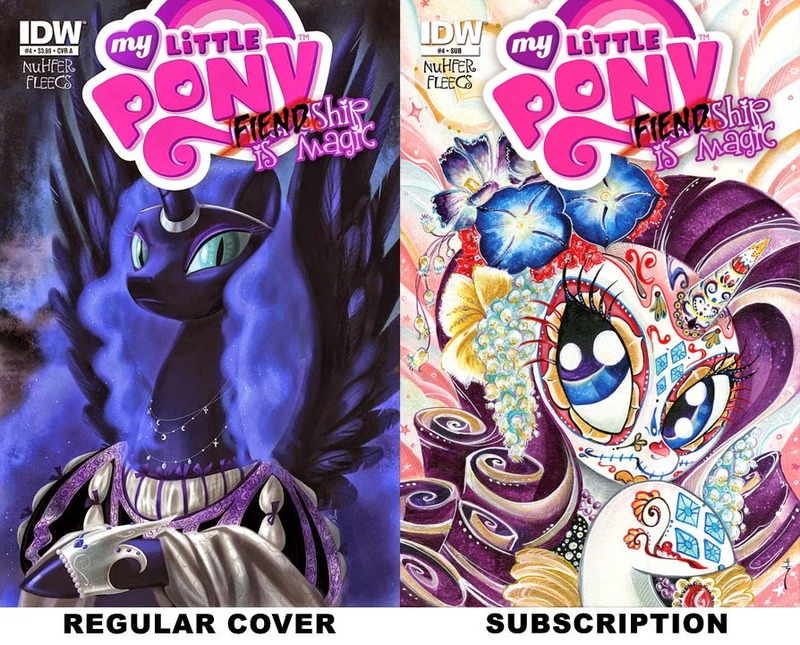 This issue came with two covers, seen below. What did you think of the book? Let us know in the comments or on our Facebook page by clicking the link at the top of the right hand menu.